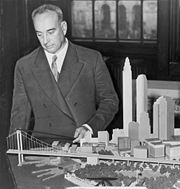 Robert Moses (December 18, 1888 - July 29, 1981) was the "master builder" of mid-twentieth century New York City, Long Island, and Westchester County, New York. As the shaper of a modern city, he is sometimes compared to Baron Haussmann of Second Empire Paris, and is one of the most polarizing figures in the history of urban planning in the United States. Although he never held elected office, Moses was arguably the most powerful person in New York state government from the 1930s to the 1950s. He changed shorelines, built roadways in the sky, and transformed neighborhoods forever. His decisions favoring highways over public transit helped create the modern suburbs of Long Island and influenced a generation of engineers, architects, and urban planners who spread his philosophies across the nation. Moses's projects were considered by many to be necessary for the region's development. 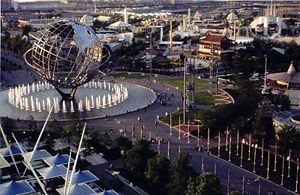 During the height of his powers, New York City participated in the construction of two huge World's Fairs: one in 1939 and the other in 1964. 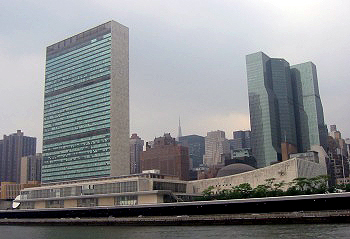 Moses was also in large part responsible for the United Nations' decision to headquarter in Manhattan as opposed to Philadelphia. His supporters believe he made the city viable for the twenty-first century by building an infrastructure that most people wanted and that has endured. Robert Moses was born on December 18, 1888, to German–Jewish parents in New Haven, Connecticut. In 1897, the Moses family moved to New York City, where the family lived on East 46th Street off of Fifth Avenue. Moses' father was a successful department store owner and real estate speculator in New Haven. In order for the family to move to New York City, he sold his real estate holdings and store, and then retired from business for the rest of his life. His mother was a forceful and brilliant woman, active in the settlement movement, with her own love of building. After graduating from Yale University and Wadham College, Oxford, and earning a Ph.D. in political science from Columbia University, Moses became attracted to New York City reform politics. At this time a committed idealist, he developed several plans to rid New York of patronage hiring practices. None went very far, but Moses, due to his intelligence, caught the notice of Belle Moskowitz, a friend and trusted advisor to Al Smith. Moses rose to power with Smith and set in motion a sweeping consolidation of the New York State government. This centralization allowed Smith to run a government later used as a model for Roosevelt's New Deal federal government. Moses also received numerous commissions that he carried out extraordinarily well, such as the development of Jones Beach State Park. Moses knew the law better than most lawyers and engineering better than most engineers, and quickly became known as "the best bill drafter in Albany." At a time when the public was used to Tammany Hall corruption and incompetence, Moses was seen as a savior of government. Shortly after President Franklin D. Roosevelt's inauguration, the federal government found itself with millions of New Deal tax dollars to spend, yet states and cities had few projects ready. Moses was one of the few local officials who had projects planned and prepared. For that reason, New York City could count on Moses to deliver to it Works Progress Administration (WPA), Civilian Conservation Corps (CCC), and other depression-era funding. At one time, one quarter of federal construction dollars were being spent in New York, and Moses had 80,000 people working under him. During the Depression Moses, along with Mayor Fiorello H. LaGuardia, was responsible for the construction of ten gigantic pools under the WPA Program. Combined, they could accommodate 66,000 swimmers. This extensive social works program is sometimes attributed to the fact that Moses was an avid swimmer himself. One such a pool is McCarren Park Pool in Brooklyn, now dry and used only for special cultural events but scheduled for reopening in 2008. Moses persuaded Governor Smith and the government of New York City to allow him to hold state and the city governments jobs simultaneously; at one point, he had twelve separate titles, maintaining four palatial offices across the city and Long Island, and actually holding control of all federal appropriations to New York City. For the city itself, he was parks commissioner, and for the state, he was President of the Long Island State Park Commission and Secretary of State of New York (1927–1928), as well as chairman of the New York State Power Commission, responsible for building hydro-electric dams in the Niagara/St. Lawrence region. During the 1920s, Moses sparred with Franklin D. Roosevelt, then head of the Taconic State Park Commission, who favored the prompt construction of a parkway through the Hudson Valley. Moses succeeded in diverting funds to his Long Island parkway projects (the Northern State Parkway, the Southern State Parkway and the Wantagh State Parkway), although the Taconic State Parkway was later completed as well. Moses is frequently given credit as the father of the New York State Parkway System from these projects. As the head of many public authorities, Moses's title as chair gave his entities the flexibility associated with private enterprise, along with the tax-exempt debt capacity associated with government agencies. The inner workings of the authorities were free from public scrutiny, allowing money to be freely allocated to expenses a public government could not sustain. Contrary to his public image, Moses horse-traded and dealt out patronage extensively, building support from construction firms, investment banks, insurance companies, labor unions (and management), and real-estate developers. Calling on these vast reserves of power, Moses quickly developed a reputation for "getting things done" and used his influence to fast-track projects in legislators' home districts, a tactic for which these same lawmakers repaid him by granting money for ever more ambitious projects. He dealt out enough spoils to both political parties to ensure he avoided unwanted attention to his patronage politics. Robert Moses had power over the construction of all public housing projects, but the one position above all others giving him political power was his chairmanship of the Triborough Bridge Authority. 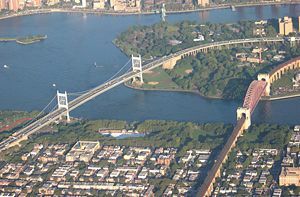 The Triborough Bridge, a cluster of three separate spans, connects the Bronx, Manhattan, and Queens. The legal structure of this particular public authority made it impervious to influence from mayors and governors, due to the language in the bond contracts and multi-year appointments of the Commissioners. While New York City and New York State were perpetually strapped for money, the bridge's toll revenues amounted to tens of millions of dollars a year. The agency was therefore capable of financing the borrowing of hundreds of millions of dollars, making Moses the only person in New York capable of funding large public construction projects. Toll revenues rose quickly, as traffic on the bridges exceeded all projections. Rather than pay off the bonds, Moses sought other toll projects to build, a cycle that fed on itself. In the late 1930s a municipal controversy raged over whether an additional vehicular link between Brooklyn and lower Manhattan would be a bridge or a tunnel. Bridges can be wider and cheaper but tall ones use more ramp space at landfall than tunnels. A "Brooklyn Battery Bridge" would have destroyed Battery Park and physically encroached on the financial district. The bridge was opposed by historical preservationists, Wall Street financial interests and property owners, various high society people, construction unions (since a tunnel would give them more work), the Manhattan borough president, Mayor Fiorello LaGuardia, and governor Herbert H. Lehman. However, Moses favored a bridge. It could carry more automobile traffic than a tunnel and would also serve as a visible monument. More traffic meant more tolls, and more tolls meant more money and therefore more power for public improvements. LaGuardia and Lehman had no money to spend and the federal government, by this point, felt it had given New York enough. Moses, because of his control of Triborough, had money to spend, and he decided his money could only be spent on a bridge. Only a lack of a key Federal approval thwarted the bridge scheme. President Roosevelt ordered the War Department to assert that a bridge in that location, if bombed, would block the East River access to the Brooklyn Naval Yard upstream. A dubious claim for a river already crossed by bridges, it nevertheless stopped Moses. In retaliation for being prevented from building his bridge, Moses dismantled the New York Aquarium that had been in Castle Clinton and moved it to Coney Island in Brooklyn where it grew, prospered and added to the attractiveness of this amusement area. He also attempted to raze Castle Clinton itself, on a variety of pretenses, and the historic fort's survival was assured only after ownership was transferred to the federal government. Ultimately, Moses was forced to settle for a tunnel connecting Brooklyn to Lower Manhattan, now called the Brooklyn Battery Tunnel. Moses's power increased after World War II, when, after the retirement of LaGuardia, a series of politically weak mayors consented to almost all of Moses's proposals. Named city "construction coordinator," in 1946, by Mayor William O'Dwyer, Moses also became the official representative of New York City in Washington, D.C. Moses was also now given powers over public housing that had eluded him under LaGuardia. Moses's power grew even more when O'Dwyer was forced to resign in disgrace and was succeeded by Vincent R. Impellitteri, who was more than content to allow Moses to exercise control over infrastructure projects from behind the scenes. One of Moses' first steps after Impellitteri took office was killing the development of a city-wide Comprehensive Zoning Plan, underway since 1938, that would have restrained his nearly uninhibited power to build within the city, and removing the existing Zoning Commissioner from power. Impellitteri enabled Moses in other ways, too. Moses was now the sole person authorized to negotiate in Washington for New York City projects. He could now remake New York for the automobile. Before Moses, most housing projects in New York were small scale (like the Queensbridge projects on the Queens side of the Queensboro Bridge). With Moses, projects grew to be the skyscrapers now widely associated with public housing. By 1959, Moses had built 28,000 apartment units on hundreds of acres. Moses had direct influence outside the New York area as well. City planners in many smaller American cities hired Moses to design freeway networks for them in the 1940s and early 1950s. Few of these were built; initially postponed for lack of funding, projects still unbuilt by the 1960s were often defeated by the awakening citizen-led opposition movement. The first successful examples of these freeway revolts were in New Orleans. Original plans for Interstate 10 followed U.S. Route 90 through Uptown, but instead the Interstate through the western part of the city was routed along the Pontchartrain Expressway. Following that adjustment was the blocking of New Orleans' Vieux Carre Expressway, an elevated highway that would have sliced through the French Quarter, resulting in an even greater impact on the city's sense of history. Later, successful freeway revolts that saw highway projects either scaled back or canceled outright also occurred in Boston, Portland, Oregon; San Francisco, San Diego, Washington, D.C., Baltimore, Toronto. Moses himself never learned to drive, and his view of the automobile was shaped by the 1920s, when the car was thought of as entertainment and not a utilitarian lifestyle. Moses's highways in the first half of the 20th century were parkways, curving, landscaped "ribbon parks," intended to be pleasures to drive in and "lungs for the city." While appearing utopian on its face, some critics contend Moses's vision of towers, cities and parks linked by cars and highways in practice led to the expansion of wholesale ghettos, decay, middle-class urban flight, and blight. Beginning in the 1960s and reaching a crescendo in the 1990s, public opinion and the ideals of many in the city planning profession shifted away from this strand of car-oriented thought, instead focusing on the more intimate Jane Jacobs-style approach to urban renewal. Moses is viewed by many as the man directly responsible for the move of the Brooklyn Dodgers to Los Angeles. Dodger owner Walter O'Malley wanted to build a new stadium to replace the outdated and dilapidated Ebbets Field. O'Malley determined the best site for the stadium was on the corner of Atlantic Avenue and Flatbush Avenue in Brooklyn at the end of the Long Island Rail Road. O'Malley pleaded with Moses to help him secure the property in a cost effective manner, but Moses wanted to use the land to build a parking garage. Moses envisioned New York's newest stadium in Flushing Meadows on the site of what would become the World's Fair in Queens. O'Malley was vehement in his opposition, but Moses would not be moved on this issue. After the Dodgers left for Los Angeles, and subsequently, The New York Giants to San Francisco, Moses was able to build Shea Stadium in Queens on the site he planned for stadium development. Construction began in October 1961 and the stadium opened in April 1964 to house the National League's New York Mets. View of the New York World's Fair 1964/1965 as seen from the observation towers of the New York State pavilion. The Fair's symbol, Unisphere, is the central image. Moses's reputation began to wane in the 1960s as public debate on urban planning began to focus on the virtues of intimate neighborhoods and smallness of scale. Around this time, Moses also started picking political battles he could not win. His campaign against the free Shakespeare in the Park received much negative publicity, and his effort to destroy a shaded playground in Central Park to make way for a parking lot for the expensive Tavern-on-the-Green restaurant made him many enemies among the middle-class voters of the Upper West Side. The opposition reached a crescendo over the demolition of Penn Station, which many attributed to the "development scheme" mentality cultivated by Moses (although the impoverished Pennsylvania Railroad was actually responsible for the demolition). This casual destruction of one of New York's greatest architectural landmarks helped prompt many city residents to turn against Moses' plans to build a Lower Manhattan Expressway, which would have plowed through what is now Greenwich Village and SoHo. This plan and the Mid-Manhattan Expressway both failed politically; to this day no superhighway goes through the heart of the city. Moses' power was further sapped by his association with the 1964 New York World's Fair. His assumption of aggregate attendance of 70 million people for this event proved wildly optimistic, and generous contracts for fair executives and contractors did not help the economics. His repeated and forceful public denials of the fair's considerable financial difficulties in the face of the evidence eventually provoked press and governmental investigations, which eventually found accounting deceptions. In his organization of the fair, Moses' reputation was tarnished by his disdain for the opinions of others, his high-handed attempts to get his way in moments of conflict by turning to the press, and the fact that the fair was not sanctioned by the Bureau of International Expositions (BIE), the worldwide body supervising such events. Moses refused to accept BIE requirements, including a restriction against charging ground rents to exhibitors, and the BIE in turn instructed its member nations not to participate. (The United States had already staged the sanctioned Century 21 Exposition in Seattle in 1962. According to the rules of the organization, no one nation could host more than one fair in a decade.) The major European democracies, as well as Canada, Australia and the Soviet Union were all BIE members and they declined to participate, instead reserving their efforts for the Seattle fair to be used at Expo 67 in Montreal. After the World's Fair debacle, New York City mayor John Lindsay, along with Governor Nelson Rockefeller, sought to use toll revenues from the Triborough Bridge and Tunnel Authority's (TBTA) bridges and tunnels to cover deficits in the city's then financially ailing agencies, including the subway system. Moses opposed this idea and fought to prevent it. Lindsay removed Moses from his post as the city's chief advocate for federal highway money in Washington afterwards, a small victory in what was largely seen as a political misstep. But Moses could not so easily fend off Rockefeller, the only politician in the state who had a power base independent of him. The legislature's vote to fold the TBTA into the newly-created Metropolitan Transportation Authority (MTA) could technically have led to a lawsuit by the TBTA bondholders, since the bond contracts were written into state law and under Article 1, Section 10 of the U.S. Constitution states may not impair existing contractual obligations, and the bondholders had right of approval over such actions. However, the largest holder of TBTA bonds, and thus agent for all the others, was the Chase Manhattan Bank, headed then by none other than David Rockefeller, the governor's brother. No suit was filed or even discussed. Moses could have directed TBTA to go to court against the action, but having been promised certain roles in the merged authority, Moses in turn declined to challenge the merger. So, on March 1, 1968, the TBTA was folded into the MTA and Moses gave up his post as chairman of the TBTA. He eventually became a consultant to the MTA, but its new chairman and the governor froze him out - the promised roles did not materialize, and for all practical purposes Moses was now out of power. Moses died of heart disease on July 29, 1981, at the age of 92 at Good Samaritan Hospital in West Islip, New York. Moses, born Jewish but converted to Christianity, was buried in Woodlawn Cemetery in the Bronx following services at Saint Peter's Episcopal Church in Bay Shore, New York. Aside from the sociological view of Moses's accomplishments, there lies the question of urban destruction and suburban mobilization. Did Moses's work degrade the quality of life in the inner city? Does increased accessibility from the suburbs improve the quality of life by enabling commuting? Was the general direction of Moses's work a damaging trend which is now being corrected, or a natural part of urban evolution? While Caro and others attributed the urban decay of New York neighborhoods to Moses's aggressive road building, it may be noted cities with far less aggressive postwar highway construction such as Philadelphia and Baltimore suffered similarly negative—or even worse—social trends. "Every generation writes its own history," said Kenneth T. Jackson, a historian of New York City. "It could be that The Power Broker was a reflection of its time: New York was in trouble and had been in decline for 15 years. Now, for a whole host of reasons, New York is entering a new time, a time of optimism, growth and revival that hasn't been seen in half a century. And that causes us to look at our infrastructure," said Jackson. "A lot of big projects are on the table again, and it kind of suggests a Moses era without Moses," he added. A testament to the enduring nature of his impact can be found in the various locations and roadways in New York State that bear Moses's name. These include two state parks (one in Massena, New York, the other on Long Island), the Robert Moses Causeway on Long Island, the Robert Moses State Parkway in Niagara Falls, New York, and the Robert Moses Hydro-Electric Dam (source of much of New York City's electricity) also in Niagara Falls. Moses also has a school named after him in North Babylon, New York on Long Island. There are other signs of the surviving appreciation held for him by some circles of the public. A statue of Moses was erected next to the Village Hall in his long-time hometown, Babylon Village, New York, in 2003, as well as a bust on the Lincoln Center campus of Fordham University. ↑ George DeWan The Master Builder.www.newsday.com. Retrieved November 18, 2007. ↑ Taconic State Parkway,www.nycroads.com. Retrieved November 18, 2007. ↑ Robin Pogrebin, "Rehabilitating Robert Moses" New York Times, January 28, 2007, (Architecture sec. ).Retrieved February 19, 2008. Robert A. Caro's Jan. 5, 1998 New Yorker article on Robert Moses and the writing of The Power Broker.www.robertmosesnyc.com. Robert Moses's reply to The Power Broker August 26, 1974, www.bridgeandtunnelclub.com. "Robert Moses and the Modern City"
This page was last modified on 24 November 2014, at 17:47.